Hello lovely girl. Are you having fun in there? Right now it looks like I'm getting a chest cold. I thought I being all smart and sleeping constantly...yeah, turns out that I was sick and my body isn't letting me do much else. Right now your dad, and his friend are moving lots of furniture so that we can finally set up your nursery! I'm really excited to see how it turns out, but it might not actually be done until December, since it looks like that's when your baby shower will be. Size of baby: A cantaloupe. I take issue with this because cantaloupes and honeydews are the same size in my world, and you won't be a honeydew for a long time (according to the website). The other comparison is to an ear of corn. I can't believe how both large and small you are! Gender: Please still be a Girl! Movement: You still like to kick when dad talks to you. It's pretty sweet. You've also been hitting both sides of me at the same time. I think you are still transverse, but that's okay b/c it's more annoying and painful when you stab my bladder. I feel your body moving around more as well, not just kicks. How I'm Changing: Tired, emotional, anti-social. I don't really want to leave the house, and I think I'm done travelling for the rest of this pregnancy. Driving out to WV was pretty hard on my back, and despite a desire to do more before you arrive, I don't think I have it in me. 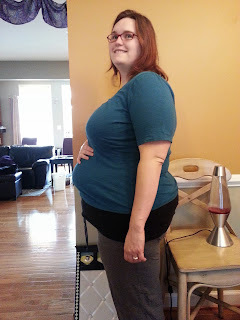 Maternity Clothes: I should buy more because what I have isn't doing it unless I never want to leave the house. How I'm Feeling: I still have niggling anxiety, especially about things like hiring our doula (who has seemingly become uncommunicative lately, which is super stressful), but overall I seem to be okay. Sleep: I am sleeping like 11-12 hrs a day, but I'm pretty sure that's because I'm sick. What I miss: Being able to plan ahead. What I'm Eating: Today...a large quantity of doughnuts. I woke up at 6:30am, and needed to go buy them. I'm still not entirely sure why. When the first place I went to was closed, instead of going home or stopping at a cheap place, I looked up another bakery on my phone. I'm going to claim it has something to do with the excellent show that was playing on NPR though. Cravings: Panera chicken noodle soup. I'm so going there for dinner. Best Moment this week: Last weekend we went out to WV and seeing our friends was amazing. They gifted me with a huge amount of baby supplies, and put my heart at ease. My friend from college also came to stay with us, and has been a huge help. I'm not sure how many loads of baby clothes laundry were done, but I give her all credit. Now for organizing them all (yeah right). and asked him to take my picture. I think you can see the need for long shirts. We are getting so excited to see you. Every time I lay down in bed, I wish I was looking down on your sweet face. Yes...life is going to be so much more difficult, and stressful when you're born...but I've never wanted anything so badly in my life.